In July 1942, Japanese forces landed on the northern coast of Papua. 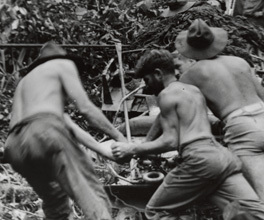 Their objective was to make their way overland along the Kokoda track and capture Port Moresby on the southern coast. This would give them control of Papua, and a base from which to attack the Australian mainland and shipping in the Pacific. The Kokoda track cuts through 96 kilometres of dense jungle and over mountains. Much of it can only be travelled on foot, which meant that all supplies and heavy equipment had to be carried. The Kokoda action lasted until November 1942 and is remembered as one of the most difficult operations by Australian troops in World War II. At first, the Japanese attack was successful. Despite winning some hard-fought battles, Australian troops were forced to retreat towards Port Moresby. Supplies ran short and tropical diseases such as malaria reduced the fighting ability of the men. There were few stretchers to carry the wounded, and even badly wounded men were forced to walk. The indigenous Papuan population had suffered badly at the hands of the Japanese, and many were fiercely loyal to the Australian forces: they cared for the retreating wounded Australian soldiers, who nicknamed them ‘fuzzy-wuzzy angels’. Saturday 29 August, 1942 - bullets everywhere – hell on earth amongst the clouds in the mountains.. When the Japanese invaded Papua, it was not an independent nation, but was governed as a territory of Australia. Normally, conscripted Australian troops could not be used outside Australia, but because Papua was Australian territory, conscripts were sent to fight along the Kokoda track. Command of the Kokoda operations did not go smoothly. The Commander of the Allied Forces in the Pacific was the American General Douglas MacArthur, who was based in Melbourne. He criticised the Australian forces for retreating along the Kokoda Track, and commanders who were unable to stop the Japanese were quickly replaced. The commander of the Australian forces, General Sir Thomas Blamey, was unpopular with his men. On one occasion, he accused his own soldiers of ‘running like rabbits’ after an unsuccessful battle. By early September 1942, the Japanese were within 48 kilometres of Port Moresby, and could see the lights of the town. But they were now far from their own supply base on the northern coast, and faced the difficulties of moving supplies and weapons along the narrow, mountainous track. Their men were now suffering from the same hunger and disease that had earlier affected the Australian troops. At the same time, American forces had occupied the island of Guadalcanal, in the Solomon Islands, east of Papua. They could use the island as a base to attack Japanese shipping. In response, the Japanese command decided to concentrate on Guadalcanal and withdrew their forces from Papua, even though they were within sight of their objective in Port Moresby. Australian and American troops followed the retreating Japanese along the track, and fought them when they reached their coastal base at Buna-Gona. They defeated the Japanese, but Allied casualties were extremely high. Overall, more than 600 Australian troops died in fighting throughout the Kokoda operation, and more than 1600 were wounded. Over 4,000 soldiers suffered from tropical diseases. Estimates of the Japanese dead are uncertain, but are probably even higher than the Allied casualties, because of the Japanese military tradition of committing suicide rather than surrendering. In recent years, walking the Kokoda track has become popular with Australians who wish to share the hardships of the original soldiers, and to pay tribute to their dedication and endurance. Today, without the obstacles of wartime, and with a professional guide, it takes about eight days to walk the Kokoda track. Even under ideal conditions, the walk is strenuous and a number of modern walkers have died on the track. The war was a political struggle for Prime Minister John Curtin, while the people prepared for invasion. The defence of Tobruk against a seemingly unstoppable German army was a much-needed morale booster for the Allied forces.